Over at my Legal Blog Watch Beat, I posted about the Walmart v. Nieman Marcus pricing dichotomy, initially described by Mike Sherman of Law for Profit. 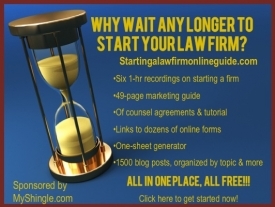 Now many of you have heard about this model before: basically, you have a choice between selling lots of legal services (volume practice) at a narrow profit margin or handle fewer cases with higher paying clients and larger profit margin. Clearly, the latter model makes sense; after all, why not work less and make more? At the same time, because I’m a lawyer and part of a system whose very integrity depends on access to law, I wonder what’s going to happen to all those clients who can only afford volume service. Services like We the People offer some hope, as do robust pro se programs. But frequently, the bar opposes expanding the scope of services that non-lawyers can provide because it vitiates lawyers’ monopoly power. We’re at a cross roads where we can’t have it both ways. If we solos want to focus on high end cases and earn more, then go for it! But as we do so, let’s not stand in the way of options for those whom we’ve priced out of our markets.